A friend of mine - Jessie - taught me how to do this. Isn't she clever?!?!? 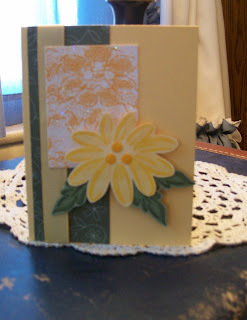 She loves to make those little ATC cards and is so very very creative. Cut white cardstock to size and run it through a Xyron machine to complete cover with adhesive. Adhere a piece of lace fabric to the sticky side of the cardstock. Sprinkle on fine glitter - any color you choose - and shake off excell. Then remove the lace. Sprinkle on a second color of fine glitter. This will fill in the places where the lace was before. Hey Ladies... you've got to go check out Elzybells new stamps. Wow! They are just too cute. I want them all... but my very favorite one is Hey Cupcake. Hmmmmmmmm... wonder which one is your favorite. Here's the link: http://www.elzybells.co.uk/ Go ahead and take a look. You know you want to! I don't know about you, but I am soooooo ready for Spring! During all the yucky winter weather we've been having, I've had plenty of time to surf the web... looking at blogs, join card swaps, buy stamping supplies, etc. It's been fun! 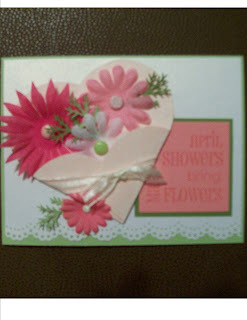 Anyway, she has this Saturday challenge this week complete with a template for making these Spring Bouquet cards. I'd never seen one before, so wanted to try it. This is what I came up with. Vivian, if you see this post, what do you think? Would this card be okay for your swap??? EEK! There's a mouse in the house!!! 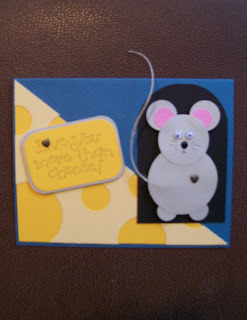 A mouse I made using my paper punches, that is. Isn't he just the cutest little thing - about as cute as a mouse can get, anyway. I had fun creating this card for a card swap I'm in. Jamie (jbkmak) is the hostess. She's great! Love you more than cheese! My dear husband bought me a box full of transparencies for our 26th Anniversary. Now, before you say, "That's not very romantic!" let me assure you, it is! Why? Because that is EXACTLY what I asked for!!! Anyway, this is my very first creation with the transparencies. It is a clear card shaped like a fish bowl. There are two adorable Goldfish "swimming" in the fish bowl (thanks to SU Fishy Friends) and some sea weeds growing at the bottom (thanks to SU Whale Wishes). 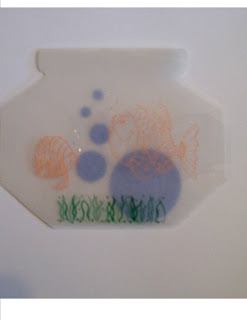 Complete with lots of bubbles, both embossed (Cuttlebug Embossing) and Stickles. I think it turned out pretty cute! I hope those involved in Jen's O-FISH-AL card swap on Splitcoast Stampers will like it, too... 'cuz I just mailed them off to her to be swapped out among some other stampers there. Happy Valentine's Day to all of you!!!!!!!!!!!!! 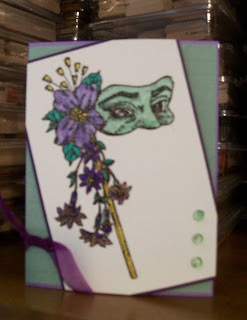 This is the card I created a couple of days ago for the Sisterhood of the Traveling Cards Card Swap that I am enjoying on splitcoaststampers.com. The theme (selected by the hostess of the month of February - Mary) is Mardi Gras. My card is tame - no beads, wild sayings, etc. But I like the glittery look of the stamped image and the color combination. I hope my SCS Sisters will like it!!! I've been searching out there in cyber space today. I am always amazed at the incredible things I find... but today I think I hit the jackpot!!! I found the most incredible blog. My!!! I was so inspired by her stamping creations that I just couldn't quit searching in her many many posts. Soooooooooo... StampOwl's Studio is the very first blog I've posted on my Blog's list. Check her out!!! I was planning to post my personal Top Ten list for January to my blog yesterday. But then I discovered the tagging situation and had to deal with that instead. Having taken care of that now, I’m ready to post my Top Ten. 10. I sorted through closets, shelves, boxes, and yes, entire rooms of my house AND took over 25 boxes of stuff to the local thrift store. 9. I redecorated our family room with a travel theme. 8. I took down the Christmas decorations – a mere 24 trees this year (compared to last years 43 trees). 7. I survived the cold cold days of January – one day it actually got as low as 38 degrees BELOW zero. That’s cold!!! 5. I finally updated my SCS gallery. 4. I signed up to be a Chemo Angel and got my buddy four days later. 3. I made 121 cards!!! 2. I got my first Avatar on SCS – thanks to enablers Cheryl and Kelly!!! 1. I created a blog!! !